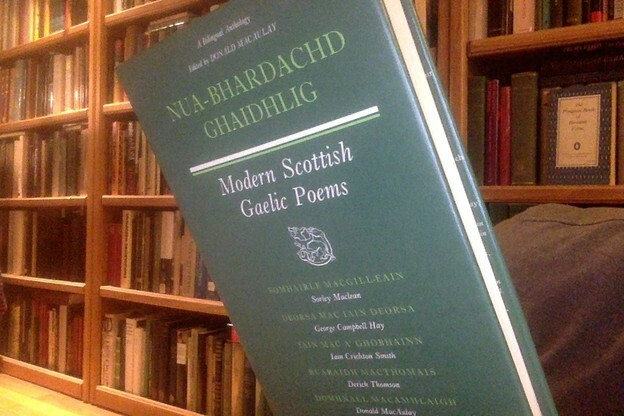 Bibliography: Modern Scottish Gaelic Poems, by Sorley Maclean, George Campbell Hay, Derick Thomson, Iain Crichton Smith, and Donald MacAulay: A bilingual anthology edited and introduced by Donald MacAulay (New Directions, 1977). Maclean's poem "Hallaig" appears on pages 84–89: English on the left, Gaelic on the right. Problem is I merely think clarity is better, I don't really believe it. If I really believed it, I wouldn't love the poem I'm posting today. To me this piece is vague—maybe because I don't understand it, maybe because it really is vague. That's my angle on Osip Mandelshtam too. I don't know if he's vague; he's vague to me. But I love him. With Mandelshtam, I always assume the stuff comes off rather less vague in Russian than it does in English, because of the rhyme and the rhythm. One of the great beauties of rhyme and rhythm is they make stuff seem like it makes more sense than it does. Maclean's case appears to be similar. He rhymes in Gaelic, see for yourself. And I feel confident the stuff is simply and straightforwardly better in Gaelic. Yet the English is pretty splendid. He has the touch. His vague created (like his theme) sublime, in number, weight, and measure, needs not rhyme. It remains to be mentioned that Frederick Seidel quotes "Hallaig" in the first poem of his third book, These Days (1989). The poem is called "Scotland." I'll append the first and last stanzas of it, why not, at the bottom of this post. "Tha tìm, am fiadh, an Coille Hallaig." ’na caorunn dhìreach sheang ùir. ag gabhail suas ri taobh an lóin. o Bheinn na Lice f’ a sgàil. gach aon ghinealach a dh’ fhalbh. a’ dol a Chlachan mar o thùs. chan fhaighear lorg air fhuil ri m’ bheò. Old men in kilts, their beards are lobster red.